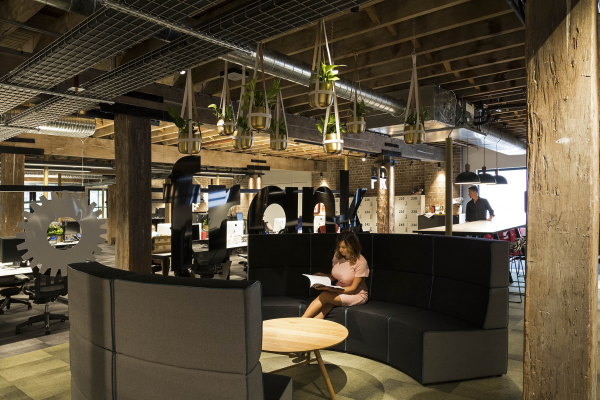 Enero is a sophisticated and contemporary workplace uniting a group of PR and marketing agencies, housed within a heritage-listed woolshed. 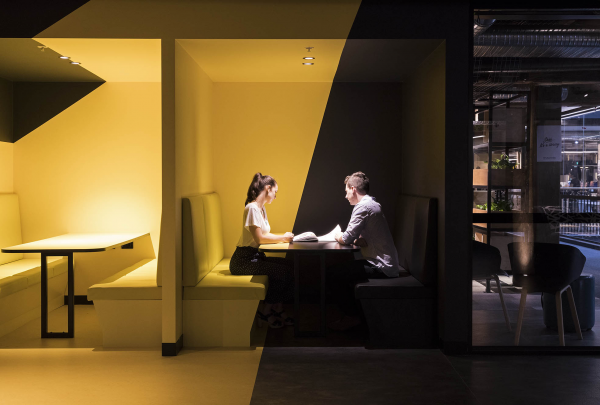 The design concept extends upon this opposing play of old meets new and includes contrasting elements of light and dark/black and white/private and open to heighten the workplace experience. Multiple advertising and PR agencies under the Enero Group co-located into Level 2, 100 Harris Street. 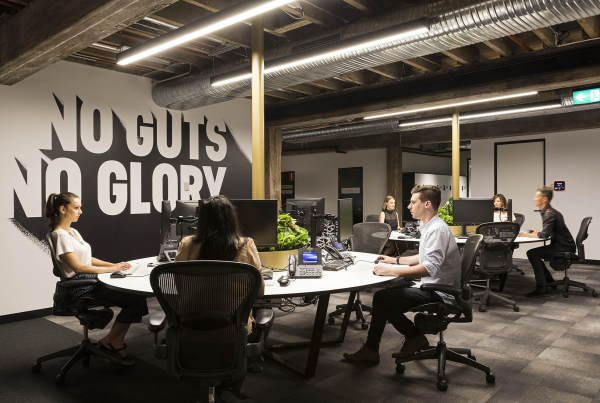 The well-known companies included BMF, Naked, Hotwire, Precinct, Frank PR, Leading Edge and Jigsaw, previously dotted around Surry Hills and Pyrmont. 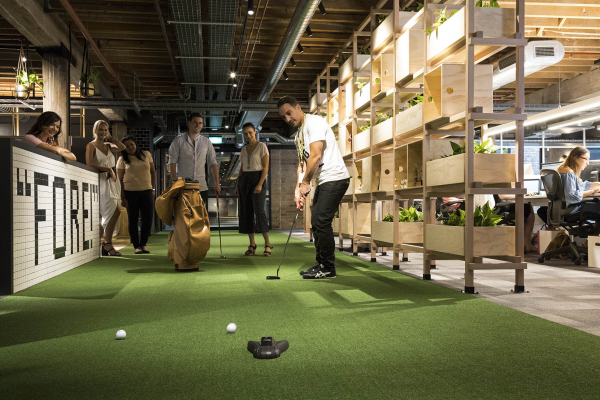 Enero Group could see the benefits of agile working and consolidating companies over one large floor-plate within neighborhoods. The result: a transition from separate to together, owned to shared. The high profile heritage building already housed reputable brands and the central glass atrium lobby allowed vistas into each of these fit-outs. The design bar was set high - people would be looking! 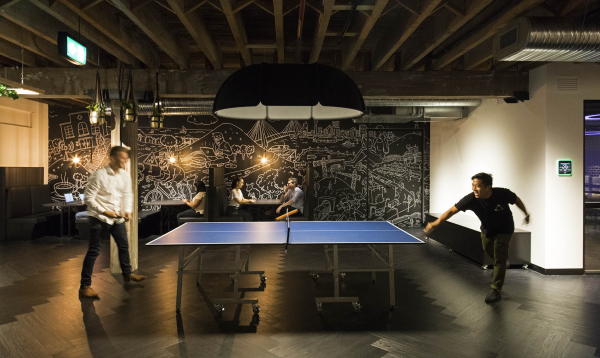 The Enero Group brief was to design a sophisticated workplace with an artistic edge. Lighting was key and we worked alongside light designers POV (Point of View) to create an emphasis on the building’s heritage and structure. Our design concept extended to include contrasting elements of light and dark, black and white, private and open. 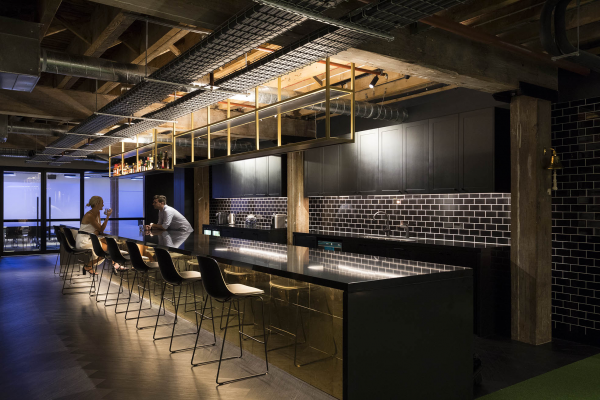 Working within the footprint of a high-profile heritage building meant that the interior had to be both contemporary and bold to hold its own within the dramatic and highly visible surrounds of the woolshed. The large arrival space presents as an art gallery with dramatic up lighting to highlight heritage timber features. The reception desk is sliced into black and white, continued through contrasting floor finishes. 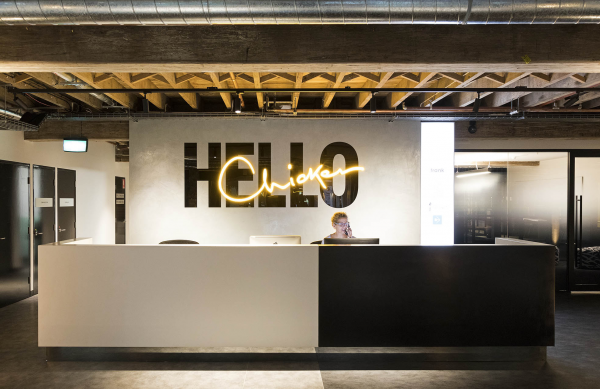 The rear reception wall illuminates the phrase ‘hello chicken’ - a playful homage to Enero’s loyal receptionist Di, who is known for her warm and welcoming salutation to visitors and staff. This space includes a series of informal meetings booths that play with perspective. When facing the booths, a dramatic yellow square becomes visible folding up from the floor to walls and dropped ceiling. The breakout/bar is a key component of the design as the Enero group love to socialize and play. 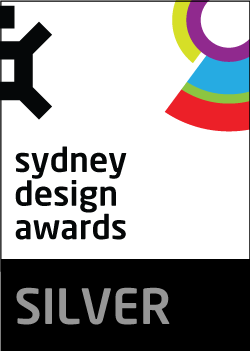 We drew inspiration from their long-standing association with Pyrmont, designing a way-finding strategy and environmental graphics around key historical and contemporary elements. The result is a dynamic environment which heroes each companies’ branding and values within a carefully considered palette of materials and finishes. There were two key challenges with Enero project. 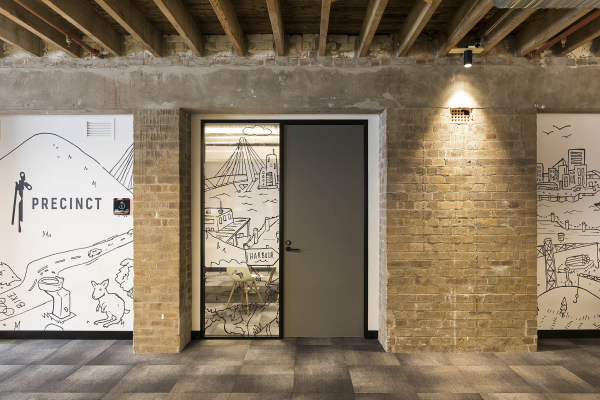 Firstly, ensuring the transition from separate workplaces to a shared floorplate was smooth and well planned to ensure each separate entity maintained its own branding and identity within the consolidated workplace. Our conceptual approach of private/open and contrasting elements carried this off structurally and helped focus the material choices. Environmental graphics were key to establishing individual company boundaries and identity. 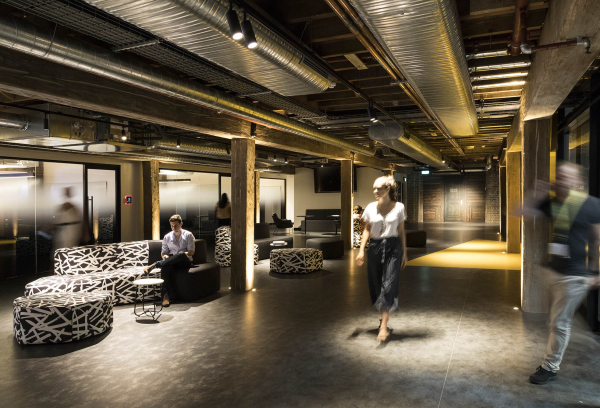 Secondly, working within the structure of a heritage building meant that the contemporary interior designed within had to both contrast with and complement the woolshed features. Clever use of lighting was key to this challenge, which once again built on our conceptual foundation. 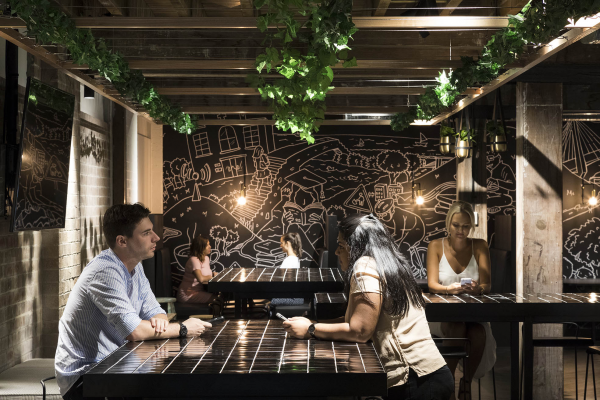 The Enero Workplace has been gently placed within the footprint of the heritage-listed woolshed, preserving an iconic piece of Sydney's past.